Bothered by fullness under the chin? Is a double chin, or even just a bit of excess fat under the chin, making you look older, or less fit, than you truly feel? If you're bothered by it, you're not alone. 67% of people are bothered by fullness under the chin. If you’re ready to get rid of your double chin forever and haven’t seen results from diet or exercise, it’s time you introduced yourself to BELKYRA. In just 2-4 sessions, BELKYRA (known in the U.S. as KYBELLA) destroys unwanted fat under your chin, permanently improving your chin contour and profile. Once you’ve achieved your desired results, further treatments are not required. What causes fullness under the chin? Sometimes, no matter how much you diet or exercise, the fullness in this area may not go away-and it may make you feel like you look older and heavier than you actually are. BELKYRA is an injectable drug whose active ingredient is deoxycholic acid, a naturally occurring substance in the body[GS1] . When injected, deoxycholic acid destroys fat cell membranes and helps with the absorption of fat. BELKYRA is both Health Canada and FDA approved. Each BELKYRA treatment takes only a few minutes, and a topical numbing agent or local freezing will make your visit virtually pain-free. The active ingredient in BELKYRA is deoxycholic acid, a naturally occurring molecule in the body that aids in the breakdown and absorption of dietary fat. Is BELKYRA right for you? The best candidates for BELKYRA are women and men over the age of 18 who are bothered by excess fat under the chin. Pregnant or breastfeeding women, or people with severe heart or liver problems, may not be suitable candidates for BELKYRA. BELKYRA is typically given in a 15- to 20 -minute in-office treatment session. Dr. Jacobs will administer a series of injections into the area under your chin at each treatment session. Dr. Jacobs will customize your BELKYRA treatment based on your treatment goals. Together, you will decide the treatment plan that's right for you. Many patients treated with BELKYRA experience visible improvement of their chin profile in 2 to 4 treatments. Some people require up to 6 treatments in order to achieve their best results. Once your desired results are achieved, additional treatments may not be needed. 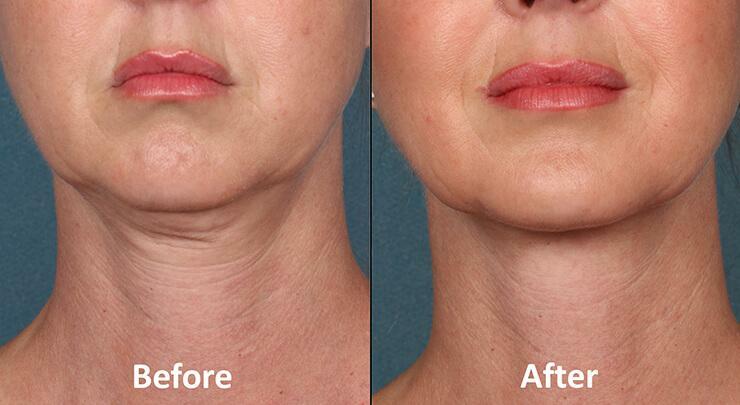 Say good-bye to your double chin forever – Contact us to find out if BELKYRA is right for you!